There is no denying that calligraphy is making a comeback. I'm seeing more and more people try it out and I think its great! I think calligraphy became a bit of a lost art for a while but it's certainly having its moment right now. 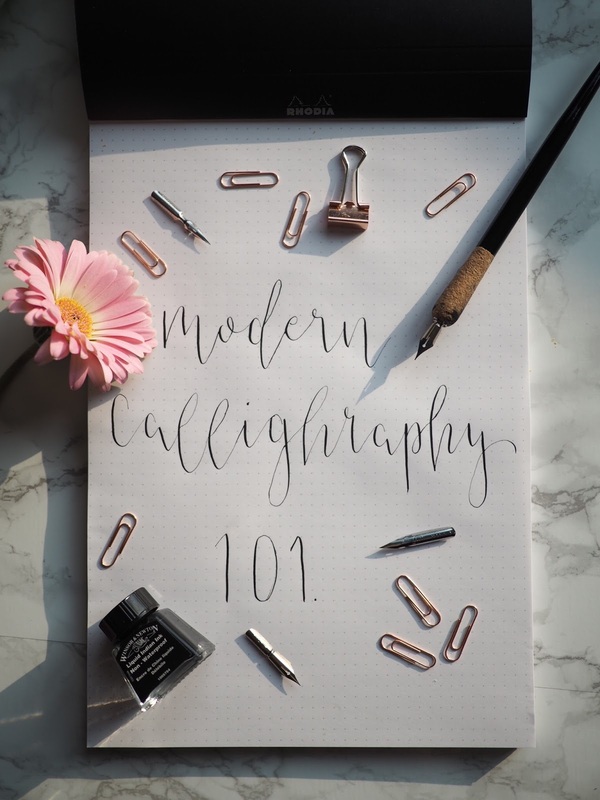 All you have to do is browse through #calligraphy on instagram and you will see thousands of amazing images and videos of people practicing hand lettering. I wanted to pull together a little post to help those of you who want to give this a go yourself. I'm going to share all of my favourite resources with you to get you going. First thing's first there are a couple of different styles of calligraphy and these produce very different effects. We're going to start with modern calligraphy but I am also going to share a post all about brush lettering, and finally iPad lettering. Modern Calligraphy is done with a nib and ink, brush lettering is done with a brush pen or a paint brush. Both methods have some similarities but produce different results. If you have tried calligraphy before and struggled it may be worth trying brush lettering and vice versa. First thing's first when you are just starting out please don't feel the need to spend lots of money of expensive kit. All you need is a nib, a penholder, some ink and some paper. You don't need to buy any books or paper as thanks to the wonderful thing that is the internet there's tons of resources available online. Graph paper is your new best friend if you can't find the Rhodia dot pad. This kind of paper helps you with the height and spacing of your letters - something that is really tricky to master at first. My favourite shops to order my supplies from are Amazon and Scribblers. Look I'm going to be honest with you - at first your lettering is probably going to look a little naff. Calligraphy does take practice and this is something you must accept. I had grand ideas that I could just pick up a nib and ink and be off but it doesn't work like that. Learning how to form the letters and join them takes time but one thing I will say is that you will be amazed at how quickly you make progress even with just a little bit of practice. Keep it fun and don't stress about it - a little goes a long way! Thankfully there are tons of free resources available online to help you. I would highly recommend the free worksheets that you can print and download from The Postman's Knock. You can print these off and practice tracing over the letters. This is the best way to practice in my opinion as it teaches you how to form the letters. Lindsey also has a fantastic in depth post about how to hold you pen, load the nib into the penholder, clean your nibs etc etc. The links to all of the free worksheet downloads are in the same blogpost so I would really encourage you to check it out. Lindsey has covered all of the bases in in her post so rather than me repeating them all here please go and read her post here. The key to calligraphy is to apply pressure on the downward strokes and remove this pressure on the upward strokes. This gives you the effect of thicker down strokes and thinner up strokes. Play around with different styles of lettering and eventually you will find your own style and it will become natural. Finally if you really want to buy some books on this Nib & Ink is a beautiful book as is, Creative Lettering and Beyond and also Modern Calligraphy. I would highly recommend though that you browse Pinterest first as there are TONS of free resources and printables available online (like these these and these) that you can use. I taught myself and didn't buy any books, I used Youtube videos, free online resources I found on The Postman's Knock, and I watched a lot of instagram videos. I am hoping to make some worksheets for you to download too and to use in my calligraphy workshops so watch this space!